Fung Global Retail & Technology had the opportunity to interview Roy Erez, Co-Founder and CEO of Loop Commerce. Loop’s gifting solution is already used by many large retailers including Neiman Marcus, Saks Fifth Avenue, and Coach. Erez shared his insights about the gifting category and the emergence of what Loop defines as “G-Commerce” (gift commerce). 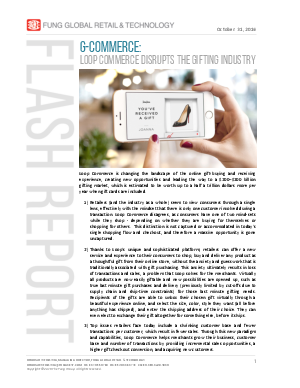 Loop Commerce is changing the landscape of the online gift-buying and receiving experience, creating new opportunities and leading the way to a $600B gifting market.